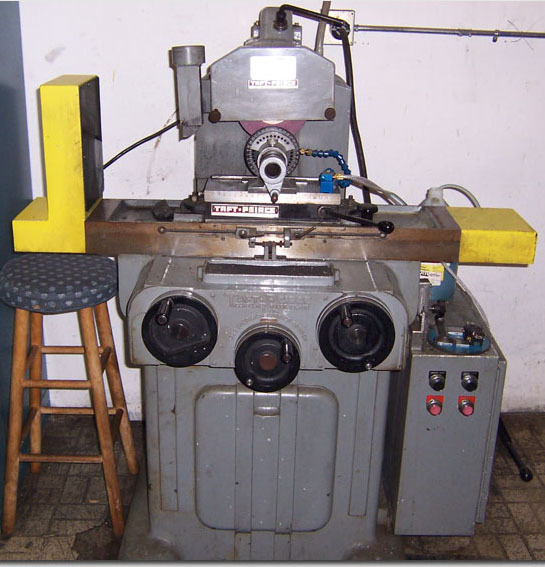 The typical precision of a surface grinder depends on the type and usage, however +/- 0.002 mm (+/- 0.0001") should be achievable on most surface grinders. The machine consists of a table that traverses both longitudinally and across the face of the wheel. The longitudinal feed is usually powered by hydraulics, as may the cross feed, however any mixture of hand, electrical or hydraulic may be used depending on the ultimate usage of the machine (ie: production, workshop, cost). The grinding wheel rotates in the spindle head and is also adjustable for height, by any of the methods described previously. Modern surface grinders are semi-automated, depth of cut and spark-out may be preset as to the number of passes and once setup the machining process requires very little operator intervention. The machine has provision for the application of coolant as well as the extraction of metal dust (metal and grinding particles). Depending on the workpiece material, the work is generally held by the use of a magnetic chuck. This may be either an electromagnetic chuck or a manually operated, both types are shown in the first image. Check out Taft Peirce's website to find out more about specification.